Yesterday was Bizzaro World in the land of Fall Out Boy. 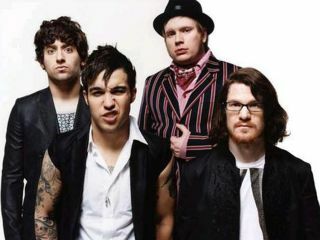 Their upcoming album, Folie A Deux, went from an early November release to 16 December - nine shopping days before Christmas. And the reason is kind of weird. "Six months ago we thought it would be a fun idea to release our album on election day but this is not the election to be cute," the band said. "We felt as though rather than making a commentary we were only riding the wave of the election. This seemed less and less like what we intended to do and more of a gimmick." Because of the election? What...? We admit, it seems like an odd reason to delay an album. Much as we like Fall Out Boy, will people really be talking about the timing of their album when the election returns are coming in? We think not. After the initial post on their website, the band spent half the day in limbo, waiting for their label, Island, to come up with an alternative date in 2008. And when Island rescheduled the album for 16 December, the band was none-too-thrilled. Again, posting on the Fall Out Boy website, bassist Pete Wentz wrote, "Folie a Deux will be released on December 16. While that late in the year may be a suprise to some, we felt that it was important to get our record out this year for our fans. Though this is not the date we had originally planned nor the optimal date according some demographic marketing analysis, we put our eight feet down told our label it must come out this year. We're already bummed enough that Chinese Democracy is gonna beat us to release. Thank you for your all your comments today, they mean alot to us. So the band is bummed. On the other hand, however, an extra six weeks may give them a chance to make a few tweaks - never a bad thing. But there is one significant impact this new release date will have that the band didn't consider: MusicRadar's podcast with guitarist Joe Trohman, set to run this week, will now be delayed until late November or early December. In the meantime, check out I Don't Care, the first single from Folie A Deux. It's all you're getting for a while.